Gizmo maker Apple just launched its official Instagram account, @apple. But this isn’t your average corporate account as the company doesn’t want to showcase its own product ad nauseam. Instead, Apple is going to share photos shot with an iPhone. In many ways, this Instagram account feels like the natural extension of the “Shot on iPhone” billboard ad campaign. Without showing the iPhone, Apple is promoting the iPhone camera as the perfect tool if you want to up your game on Instagram. Every year, there are more than a trillion photos taken on various iPhones. Chances are that there are people in every corner of the world currently using an iPhone to shoot a unique photo or video. So Apple wants to leverage that and showcase the creativity and diversity of iPhone users. 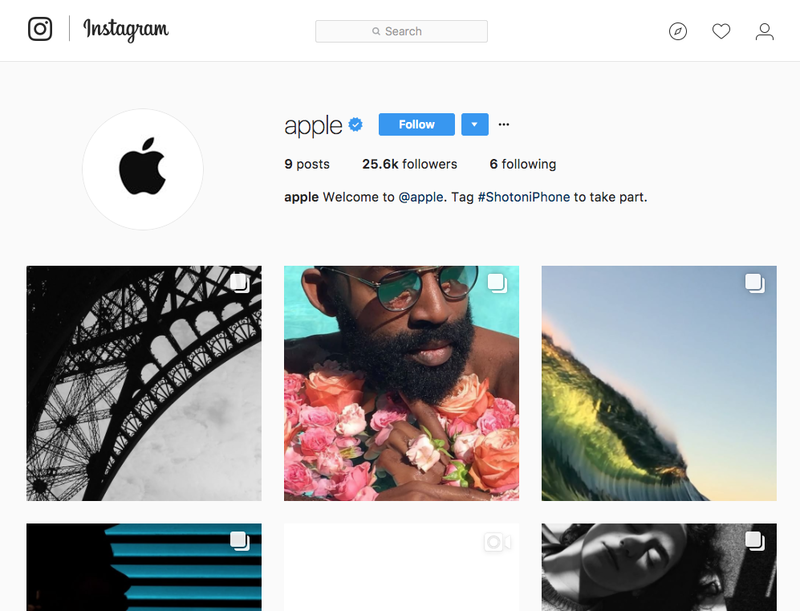 Based on the first posts, curators working for @apple find some photos captured with an iPhone, ask the creator if they can share them and repost them on the company’s account. Apple isn’t taking any photo itself. There are a few interesting things with the account. First, Apple relies heavily on the recently introduced gallery format to showcase five creators at a time. You can find them on Instagram by reading the captions. Second, the company is using videos to share a few photos at a time, add sound effects and interview the creators — those sound bites remind me of Humans of New York. Apple is also sharing Instagram stories with the same format. Third, Apple uses the #ShotoniPhone hashtag in the account description and below each post. It’s clear that the company wants to encourage people to use the hashtag so that it becomes a pop culture symbol. Many popular Instagram accounts use this method to resurface popular posts as well, such as @ihavethisthingwithfloors. This isn’t Apple’s first Instagram account — @applemusic currently has 2.2 million followers. I’ve also seen Apple ads for Apple Music and the Apple Watch on Instagram. But it’s interesting to see Apple creating an “Instagram-native” account.